No doubt professional staffers at IWD cringe every time that number comes out of the agency. But no doubt the Governor is pleased. For some time now, the Iowa Policy Project and others have noted a bogus statistic that has been inserted into official jobs data provided by Iowa Workforce Development (IWD). It just keeps getting better — the fake statistic — because it is designed to work that way. 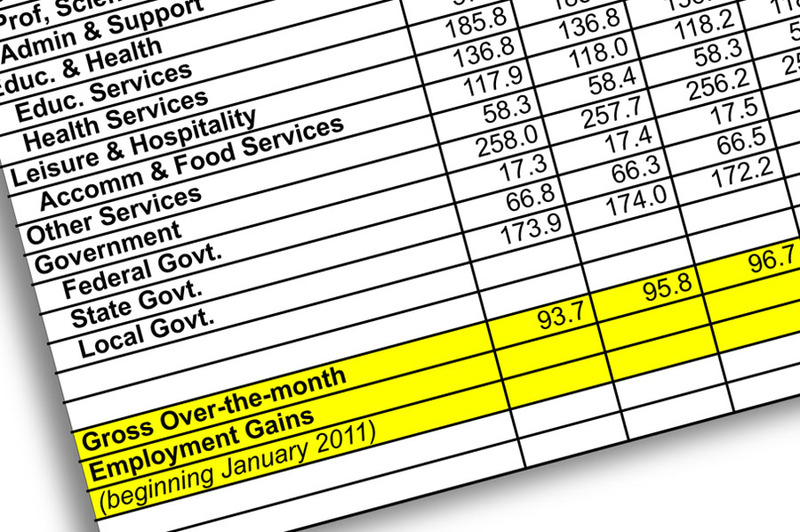 “Gross Over-the-month Employment Gains” is an extra line that has been added to IWD’s seasonally adjusted, nonfarm jobs spreadsheet, which provides month-by-month data by job sector, back to January 2008. Below the standard table of rows and columns is the special line, with numbers reflecting the gains-only count since January 2011, when Governor Branstad took office. Construction up 200 but manufacturing down 400? No problem. Ignore the manufacturing losses and call it a gain of 200. That is exactly how this method treats job counts. And now there’s a new wrinkle. Previously, IWD only showed what the count looked like for each month, with no overall total. You had to add the numbers yourself. Beginning with the latest report, the ever-helpful IWD now takes care of that for you, or for whomever would want the meaningless number. With the latest report, IWD makes it a cumulative count. Our experience with IWD staff is that they are professionals. No doubt they cringe every time that number comes out of the agency — whoever ordered them to compile it. But no doubt the Governor is pleased. While the number is a total distortion of reality, it shows him close to the pace he would need after three years (120,000) to get to his magic goal of 200,000 jobs in five years. Kind of like winning a basketball game by shutting off the opponent’s side of the scoreboard, but, whatever it takes, right? 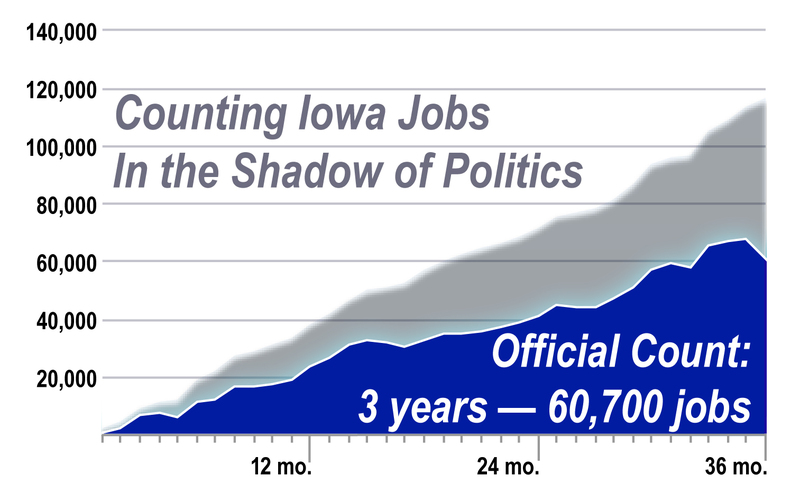 So, in case you’re interested, Iowa’s economy has created a net increase of just under 61,000 jobs since the Governor took office — about half of what he’d need to be on pace toward his goal. For a real analysis of Iowa’s job picture, see IPP’s monthly Iowa JobWatch report, or our annual report on The State of Working Iowa. Now it’s one thing if the Governor’s campaign wants to peddle silly job numbers under its own letterhead. But it is wrong — flat out wrong — for official data to be presented by IWD with what amounts to a political campaign line for the Governor. For those of us engaged in nonpartisan research and analysis, the political tainting of IWD reports is a great disappointment. Like us, IWD should be trying to determine and illustrate the actual job picture facing our state, so policy makers can make decisions in that light. IWD and all state agencies must be neutral players if their mission is to serve all Iowans — not someone’s political agenda.